Hello Thomas Carli! Thanks so much for taking the time to answer some questions for our readers. A: I was lucky to be raised in a family where artistic activities were an important part of life, my mother is a painter and she encouraged me to draw since I was young. 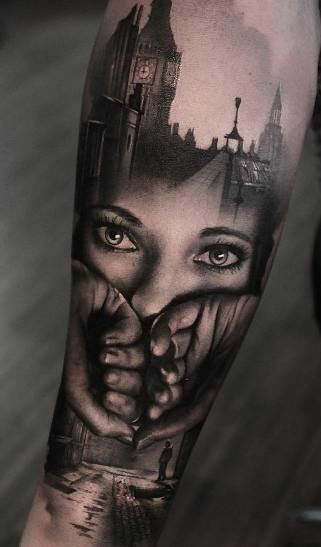 She gave me a permission to get a full sleeve when I was 16 and I think by working and tattooing I have proved that I was quite serious about it at that time! I grew up in the depths of French countryside, so I had all the time in the world to do what I liked - and I chose drumming and drawing, and I was on it 24/7 - I have never really partied or drank when I was a kid. 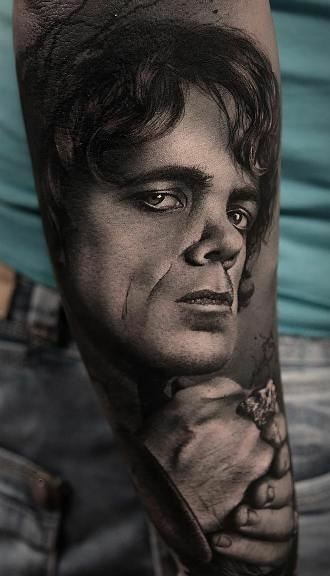 I was able to catch up with all the party drinking thought when I went to a music college in London :) but that lifestyle was not really for me, one year of it was enough, then I got professionally into tattooing. Q: Was it hard to learn the basic skills of tattooing? Did anyone help you? 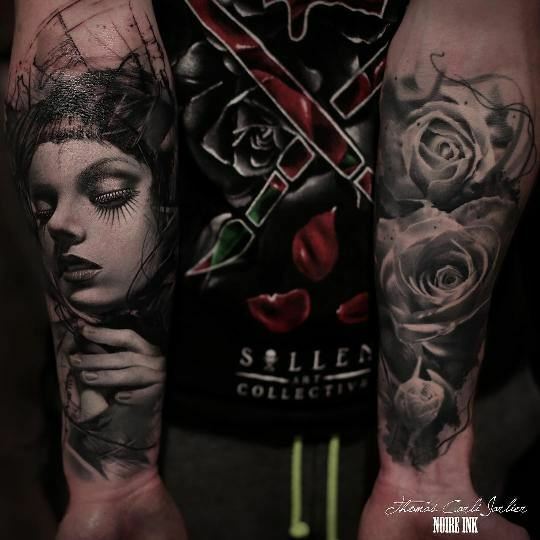 A: Of course it is a constant battle to learn and master new skills, you never stop learning in tattooing, sometimes you spend sleepless nights thinking about how to improve or make up a new technique. Overall it has to be a passion, otherwise it is impossible to advance and get better. I learned most things by myself, by trial and error. The rule is - you do ruin a few pieces in the beginning before you understand the basics. Every artist, even famous, has a piece or two from their early days that they are terribly ashamed of! My advice for young artist - talk with different experienced artists, read magazines and forums about techniques, keep searching for and absorbing all the information you can get! Q: Something that I find fascinating about your style is the depth in your tattoos. 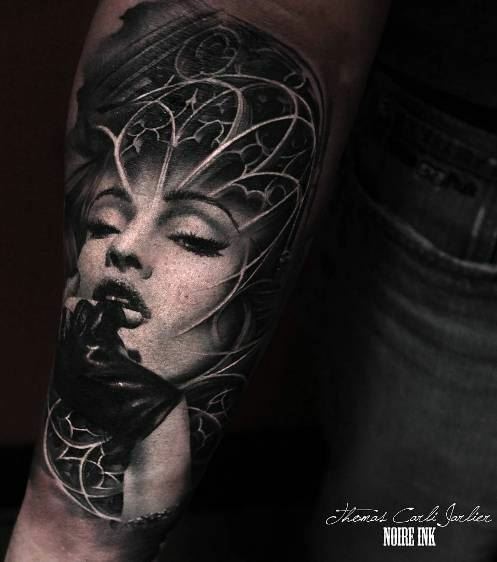 Such a beautiful balance between black and white ink, that makes every tattoo really special, even when the tattoo is fully healed. 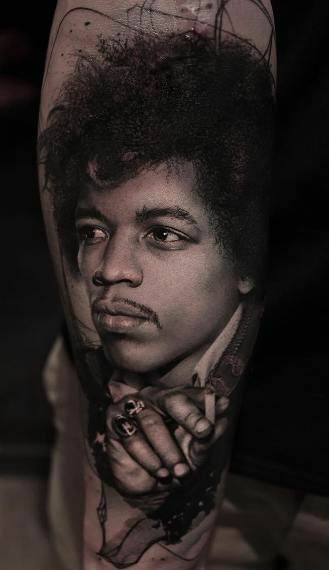 How much the knowledge of tattoo ink is crucial? You can point out some important aspects. A: Thank you for your kindness: understanding ink is important, but also skin, how it acts with different needles, depth of ink deposition, shades you are using, machines, etc etc. 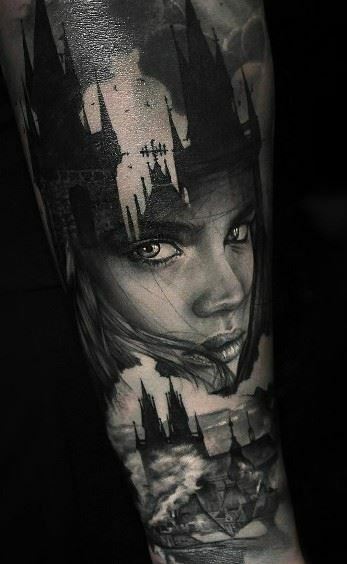 For me pure black ink is the cornerstone of any tattoo in black and grey. If the blacks are correctly deposited and well saturated, it will heal well and stay contrasted. A: I find that understanding the anatomy of the face, skull, muscles is a key to a good photo realistic portrait. If you see where the light hits the skin, where the shadows fall, how deep they are - you will be able to keep good balanced proportions. I first thought about it when I read about the works of Da Vinci - he was actually dissecting corpses to understand every bump and pit on the body and was sketching body parts in different positions. 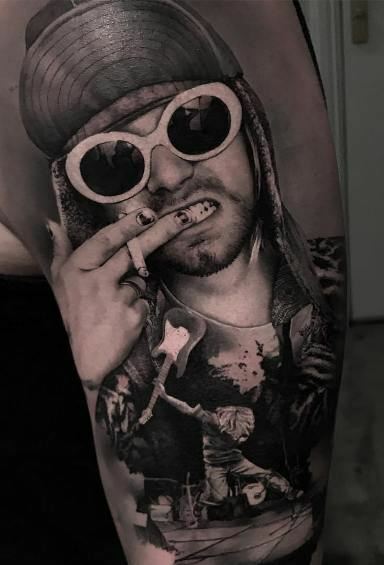 What can be even more challenging then a portrait itself, is tattooing an image of a hand or hands (that can be a part of a composition with a portrait). Keeping perfect proportions of hands and fingers on the design is a key here. 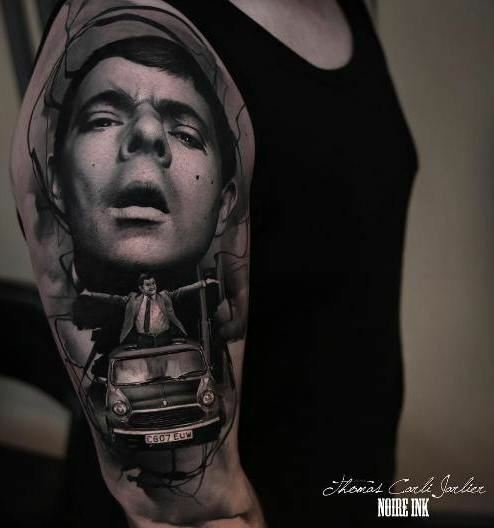 Q: The Mr.Bean tattoo...ah so awesome! It brings a lot of childhood memories! :) I love the two images of him mixed in one beautiful piece. 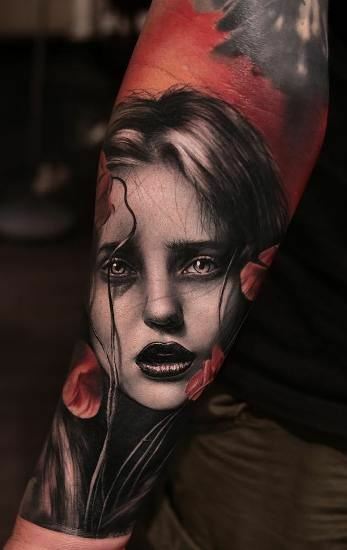 I see the beautiful mixture in other tattoos too. How do you develop your basic ideas to the final one, do you use a sketchbook? Tell me about the making process. A: Thank you, it was one of the funniest pieces. He is my hero. I use photoshop a lot to create compositions, and also different brushes, many of which I make myself. Usually I find the right images and then spend time arranging and modifying them until the composition is balanced. Q: Do you negotiate with your clients when it comes to the ideas? 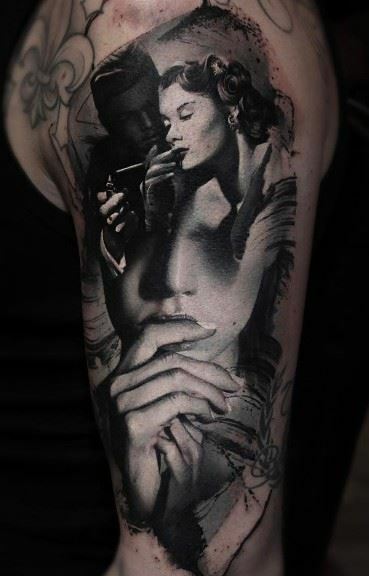 Would you refuse to tattoo one design couple of times? 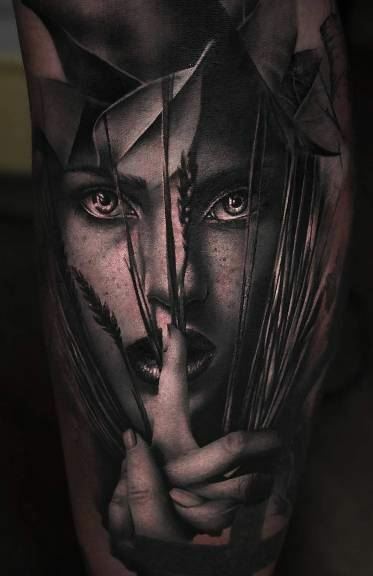 Q: What are some of the biggest challenges about being a professional tattoo artist? Would you change something about your work? Do you have any progress idea that you look up to? A: The main challenge is to stay true to yourself and not change who you are no matter what happens. The industry will want you to fit in, there will be haters, the envious - but if you stay who you are you will get over it. Stay humble and learn, that's my recipe for being happy professionally. Q: Where are you locate now? A: Our studio Noire Ink is located in Clermont-Ferrand France, in a beautiful region where I was born. Q: How much traveling and going on tattoo events changed your perception when it comes to professional tattooing? A: It's definitely very important to go to conventions and meet talented artists, exchange thoughts and knowledge with them, it surely makes you grow. But it's also very important to remember the primary motivation: you tattoo for your own clients, to make them happy, but not to be appreciated by other tattoo artists. It's destructive to the industry that some play the "popularity game" and are in tattooing to manifest their personality/attitude: let's not forget that we tattoo because we deeply like the whole process - just like blacksmith is passionate about working with metal, glazier - about glass, a tattooist - about the skin and ink. A convention is a scene for your art, not for your ego. Well, the downside is, I am usually one of the least well dressed people at events. Please feel free to write the upcoming events that you're attending so my readers will have the chance of meeting you. End of 2017 events: Barcelona tattoo convention, Cezanne Tattoo Ink (Aix-en Provence), Evian tattoo convention. Q: Any motivational words for those who are starting out? A: Take your time! Don't rush, it's very important. Be patient, in the beginning you might need to spend 5 hours on an inch sized piece (poor tattooed person - but hey, they chose to be your test subject) to make it good, and as I said earlier, there is no way to succeed without failing a few times. Just be passionate about the subject, do it for the right reasons, again, because you love it. You only have things to prove to yourself.